"Thou art a subject of the divine, created in the image of man, by the masses, for the masses." The original THX 1138 (1971) theatrical poster. Hardly inspiring. Lucas’s first full-length film is a stark, cold sci-fi thriller set in an underground society, its denizens drugged into a cattle-like state of being ruled by a super-rational computer-driven bureaucracy enforced by eerily polite chrome-faced robot police officers. It’s an unrelenting socio-political statement on consumption, religion, government and the struggle for individuality. On paper bearing all the hallmarks of a film student’s first outing—too heavy-handed for its own good—yet somehow executed with a subtlety and grace, a poetry even, that makes it linger long after the last frame rolls across the screen. It’s remarkable not simply because it’s an obtuse film (there are after all plenty unremarkable obtuse films around) but because it is a virtuoso piece of film-making, combining its unique style of photography—disconnected, observing and visually distinct—with an unparalleled collage-like soundscape from the hands of Walter Murch. From Look at Life and up through the race car aesthetics of 1:42:08 and the first fledgling themes of Freiheit and Electronic Labyrinth: THX 1138 4EB, the lineage leading to THX 1138 is clearly one close to Lucas’s heart, and the result is mesmerizing, unique and unapologetically dense, bordering on alienating. Not oddly, given their relationship, THX 1138 continues the thrust of Electronic Labyrinth and piles on in three non-demarkated, yet distinguishable acts: love, imprisonment and escape—wherein each of those themes is examined in turn. But before a single frame of its future dystopia runs through the projector, the theme of heroism and a first clamor of things to come, is introduced: “You know, there’s nothing supernatural or mystic about Buck,” the Buck Rogers trailer claims, “He’s just an ordinary, normal human being who keeps his wits about him,” setting up the character of THX to be a Buck Rogers equivalent of the film we’re about to watch. Except of course, where Buck Rogers is unapologetically heroic in the fight against the evil Mongol Reds, on behalf of ‘the greater good’, THX is decidedly unheroic, fighting only for himself, and for no reason ever articulated. In fact, he seems entirely incapable of carrying the burdens of the collective, leaving in his wake LUH, his lover, the devious but protective SEN, and even the child-like and helpless hologram. He can’t carry anyone but himself to safety, and even he only manages by the skin of his teeth. This scared and naive individual prevails, but at the cost of everything he had; a price which the film posits, may be necessary to pay for individual freedom. We have become used to thinking of heroism as something that simply happens to people; indeed the word has been in a sense cheapened by the modern habit of calling everybody exposed to any kind of danger, whether voluntarily or not, a “hero.” Soldiers—indeed all those in uniform—are now commonly referred to as “our heroes,” as if heroism were a universal quality shared by everyone who bears arms, or as if it were an accident, not a vocation. Even those who die in terrorist attacks, and have thus had the bad luck to be in the wrong place at the wrong time, are described as “heroes,” though given the choice most of them would no doubt have preferred to be somewhere else when the blow was struck. Even the THX of Lucas’s student film was pronounced “Incredible!”, while the THX of the feature film gets no such recognition. He may be “just an ordinary, normal human being who keeps his wits about him” (barely), but is he a hero? Beyond the thematic content of THX, which while delivered in a layered, complex, almost abstract manner is as simplistic, if antithetical, as that of Star Wars, there are many points of similarity between the structuring and aesthetics of the two seemingly wildly differing films. The abrupt division of acts as well as their discrete contents foreshadows those of Star Wars, first in the loss of LUH at the hands of some incomprehensible fate early in the story. The small group of ‘rebels’ escaping from a prison and making their way through the maze of the underground city. And the faceless ‘empire’ personified (or not) respectively by the chrome-masked robot police and the stormtroopers. In both cases it’s the individual vs. the system, whether the system is overly benign in its intention as is the case in THX 1138, or not, as is the case in Star Wars. Most of all, the final pursuit through the tunnels can’t help but bring about the speed and urgency of X-wings and TIE fighters screaming past the camera in very similar tunnel pursuits. Whip-pans track the super-car and the robot police, radio-distorted voices talk pseudo-gibberish at the control center which follows the action from afar and neigh identical intercutting of internal/external shots. The parallels to the attack on the Deathstar are obvious, as are the differences: much less ‘action’, no shots fired, no explosions and a diametrically opposite purpose, flight, rather than fight. Regardless, for a sequence involving a car and two motorcycles driving through a tunnel, it manages to be spectacularly tense, an entirely cinematic achievement: camerawork, editing, and sound. And though it’s much more willing to experiment and confuse its audience, playing with surveillance camera POVs or lingering on environmental details (a lizard at home amongst wires and circuitry), obviously less concerned with pace than with simply lingering, soaking up the world, the fittingly detached, observing camerawork of THX 1138 equally foreshadows the ho-hum mundanity later used to make the topsy-turvy world of Star Wars seem perfectly normal. To be blunt about it, THX 1138 is perhaps the only film in which Lucas has properly exercised his belief in purely editorial and visual cinema – cinema púr – over dramatic or narrative cinema (as in the works of his mentor, Francis Ford Coppola). It’s a film concerned with creating an experience through collage of image and sound, by editing and layering, more than it is with the story or emotional state of its protagonist, who by virtue of the concept itself, is almost devoid of such and indeed even traditional narrative. As a result, THX 1138 asks of its audience attention and dedication, inviting intellectualization. The theatrical poster for Alphaville (1965). The French New Wave, La Nouvelle Vague, which had cast its waters onto an unsuspecting shore in the late 50s, with films like Godard’s Breathless and Truffaut’s The 400 Blows, put an unsuspecting film industry on its ear. It had subsided in the intervening years, peaking before Lucas entered USC, though its effect on the students there had not. Remarkable for its disregard of old school techniques and production methods, the Nouvelle Vague directors shot cheap and fast, handheld, with little or no crew, or money, staying so flexible as to at times simply disregard scripts, sets or even ‘proper’ actors. La Nouvelle Vague had come from the ranks of the French Cahiers du cinéma film magazine; from critics fundamental in the re-evaluation of certain directors, such as Alfred Hitchcock, as ‘auteurs’, a term coined by Cahiers du cinéma. The film makers that later emerged from the ranks of the magazine, would go on to make films that would often comment on or echo older Hollywood films, framing themselves around genre tropes, such as gangsters in Breathless. 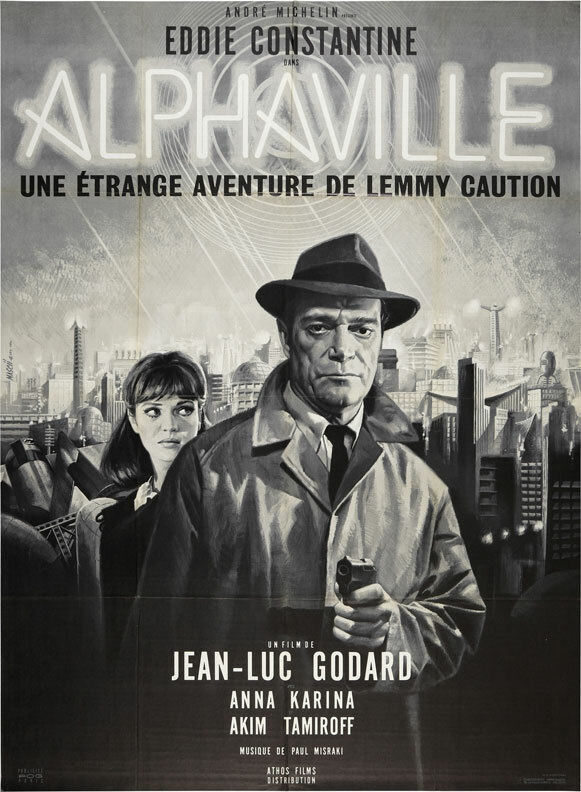 One of the last films to come out of the Nouvelle Vague movement was Jean-Luc Godard’s dystopian 1965 sc-fi classic, Alphaville: Une étrange aventure de Lemmy Caution which tells the story of secret agent Lemmy Caution and his mission to find and deal with Dr. Nosferatu in the vast city of Alphaville, where people live rational, emotionless lives under the watchful eye of the computer, ⍺60. Aside from the ‘Nosferatu’ nod, Godard makes liberal use of references to other films throughout Alphaville, as he was generally wont to do, framing the entire film in the tradition of film noir and their hardened gumshoe protagonists. Lemmy Caution, the protagonist of Alphaville had started his life in the pages of Peter Cheyney’s crime novels, many of which had been made into French movies starring Eddie Constantine, who continued the role in Alphaville. Here he became a secret agent, codenamed 003, appropriately echoing a certain other secret agent. However, the downtrodden, soulless character of Lemmy Caution took a rather radical departure from the more suave origins of the character, whom Constantine often described as “James Bond before James Bond”. And yes, speaking of references, it is of course impossible to mention totalitarian states without turning to George Orwell’s 1948 book, 1984, and though there are marked differences between the three works, the influence is undeniable (if for nothing else, in feeding into Lucas’s love of numbers). While the stories of Alphaville and THX 1138 are wildly different, the settings share many obvious parallels in the outlawing of emotions, the belief in rational thinking, and a society run by a cold calculating computer. But more than that, THX 1138 also draws from Godard’s film a sense of constant surveillance throughout as well as specific close-ups of contemporary machines, and a total disregard for audience-friendly exposition, effectively leaving the viewer in the dark about the goings-on for most of the film. Murch may claim that the intentional obtuseness of THX 1138 was drawn from their love of Japanese film, but I dare say it came not from Japan, but from France. Just as important was the Nouvelle Vague spirit of shooting entirely on location, remarkable in the case of Alphaville, which supposedly takes place in the far future after the invention of interstellar travel, yet everything looks like mid–60s Paris. THX 1138 too was shot almost entirely on location around San Francisco, partly in the tunnels of the then still under construction Bay Area Rapid Transit (BART) system and in nuclear power plants. And while the studio may have balked at the confusing final film, there’s no denying that they got their money’s worth in location work. As an aside, though Ridley Scott is fond of namedropping Metal Hurlant and Moebius as influences for his 1984 masterpiece Blade Runner, it’s easy to see the parallels between its ‘future noir’ trappings and the strange adventures of Lemmy Caution in Alphaville; so much so that Blade Runner could be a distant remake, and Lemmy, Deckard, 20 years on. Another film which would go on to be tremendously influential on the young Lucas came out in 1968, after his student short, but a couple of years prior to THX 1138, while Lucas was still at his most impressionable. One would be excused for thinking that Lucas were describing his own first film, or that his statements were indeed from that early period in his life, and sure enough, they put into context the tremendous influence Kubrick's 2001: A Space Odyssey had on the young filmmaker as he was about to begin his career in earnest. Where 21–87 lends its hectic editing and at times infernal soundscape to THX, 2001 lends its long takes, slow building, abstract bright spaces, emotionally detached people and the so-benevolent-it’s-malevolent computer. 2001’s people drift into the black, THX 1138’s into the white, all the while neither film eschews any chance for non-sensical techno jargon. It’s interesting to note the spiritual themes that run throughout 21–87 and 2001, both of which are arguably ambiguous about answering any questions raised, all of which is true for THX 1138 as well. Furthermore, one of the largest influences on Stanley Kubrick as he set out to make 2001: A Space Odyssey, was a half-hour documentary called Universe (1960), directed by Roman Koitur and Colin Low for the National Film Board of Canada (home, as you will remember dear reader, also to Arthur Lipsett and 21-87). And as with 21-87 a few years later, it too was nominated for an academy award (Best Documentary Short Subject, 1961), and Douglas Rain, who narrated Universe became the voice of HAL. Small world. While most storytelling is generally divided into distinct acts and sequences, the three discrete acts of THX 1138 (being love, capture, and escape) share a similarity to the way Kubrick would structure his films around his so-called loosely connected ‘non-submersible units’ of story, a structure which is particularly noticeable in 2001’s structure (being Dawn of Man, The Dig, The Discovery, Star Gate and Alien Zoo). The two films also share a trivialization of the fantastic and the grotesque, which while not uncommon at the time in sci-fi, was a marked storytelling device of 2001–exemplified by a trip to the moon so boring that Dr. Heywood Floyd would rather sleep than gaze out of the window, or discuss sandwiches with his colleagues as they fly across the moon towards the mankind’s greatest discovery–and an important piece of the language of first THX 1138, and later Star Wars. And should one be unconvinced of the familial lineage, one needs only look at the one certain commonality: 1138, 1984, 21–87, 003, ⍺60, 2001. Lucas’s penchant for scraping together pieces of films and pop culture is clearly evident in THX 1138 when you know what to look for, and while it is a very different kind of movie from Star Wars, the two share a remarkable amount of DNA. It would be fascinating to know what would have become of Lucas, had THX 1138 found its audience and he in turn hadn’t made American Graffiti, a film which could almost be argued to have spoiled his idealistic penchant too soon. Yes, it yielded Star Wars, but what films were we robbed of? As an aside, in what may simply be a strange coincidence, Mark Romanek’s video for David Bowie’s 1993 song Jump They Say, uses pretty much the exact same influences (with the exception of 21-87) as THX 1138, while looking nothing like it. To go along with THX 1138 Lucas also directed a short 2-minute promotional piece meant to provoke interest in this outlandish film of his. It was called Bald, and intercuts short snippets of conversations between Lucas, Walter Murch and Francis Ford Coppola, discussing how Lucas could bring himself to cut the hair of his leading actress, while a man cuts a tear-filled Maggie McOmie's hair off and hands it to her, before shaving her head bald. Michael Korda. Hero - The Life and Legend of Lawrence of Arabia. Harper, 2010. Marcus Hearns. The Cinema of George Lucas. Harry N. Abrams, 2005. Gary Leva. Standing on the Shoulders of Kubrick: The Legacy of 2001. Warner Brothers, 2007. Available on the 2001: A Space Odyssey blu-ray.